Cinecitta, for those unfamiliar, is Italy's answer to Hollywood. While in Rome, Stuart and I took a relatively short train trip (relatively short by Australian standards) to a place called Cinecitta. Our main reason for visiting this fascinating place was because it contains the set of the television series Rome - one of our favourite T.V. shows. I'm embarrassed to admit that before visiting Cinecitta (which means Cinema City in Italian) I knew very little about the Italian film industry. I'd heard of Federico Fellini, and of course Martin Scorsese, but other than these two accomplished gentlemen, I was ignorant. Well, I was in for an eye-opening experience, and I recommend visitors to Rome visit Cinecitta. As a writer, one of the highlights for me was learning about Suso Cecchi D'Amico. If the name doesn't ring any bells for you, that's because this lady was not in the spotlight, but nevertheless played an enormous - and very important - role in Italian film-making. Ms D'Amico was a script writer, and from what I learned, she was an extraordinary woman. She is credited with writing 122 scripts over the course of a career spanning some 60 years. She won a huge number of awards, including Oscars, and was nominated for many more, and she worked with some of the most respected directors in the business, one of whom, Luchino Visconti, teamed with her on nearly all of his films. So, why did I find Suso Cecchi D'Amico so interesting? There are a couple of answers to that question. First of all, her writing skills continued to be in demand for so many years - the last script she is credited with writing was in 2006, only a few years before she passed away, and since she lived to a ripe old age, that meant she was still churning out great works at the age of 92! Secondly, and probably more importantly, is that Ms D'Amico's professional longevity illustrates her remarkable talent to adapt her writing style through so many different genres and times. Genre is one thing, I mean I write womens' fiction, I don't stray into science fiction, speculative or other styles simply because, at this point in my career, it doesn't suit me. I can't imagine how difficult it must be to move from one genre to another, then to another, all within the space of a year ... or less! More than genre, is the changing language that must be used. When spanning a writing career of some 60 years, imagine how much language, its idioms and slang would have changed in that time. There are trends in language too, words that might have been considered cool or funky fifty years ago are not so anymore. So, we're talking about a lady who in her sixties, seventies, even eighties, was so in tune with writing and writing trends that her skills were still in demand. While researching this blog, I read a number of reviews about Ms D'Amico and one of them commented that she was well-known for her cultural versatility, sophistication and her attention to realism in her scripts. Apparently, she was also careful about the actors for whom she was writing. For example, she noted that Italian actors were not fond of long, drawn-out dialogue so she gave them short, concise lines instead. I think there are lessons for all writers, whether we're writing scripts, fiction or otherwise. Our writing should always be fresh and enthusiastic, our characters are expected to be new and unfamilar, we must ensure our dialogue suits the times and our writing style must satisfy the readers' thirst. Further, it's imperative that we keep up with the trends, for example, I was speaking with a literary agent a couple of months ago who told me that only a few years back she couldn't get enough vampires. Gorgeous, blood-sucking dudes were all the rage. These days, she wouldn't be able to sell a vampire novel if Alexander Skarsgard delivered it himself. Don't know who I'm talking about? You haven't seen True Blood, have you! Oh dear ... I'll save that for another blog ... hehehe! 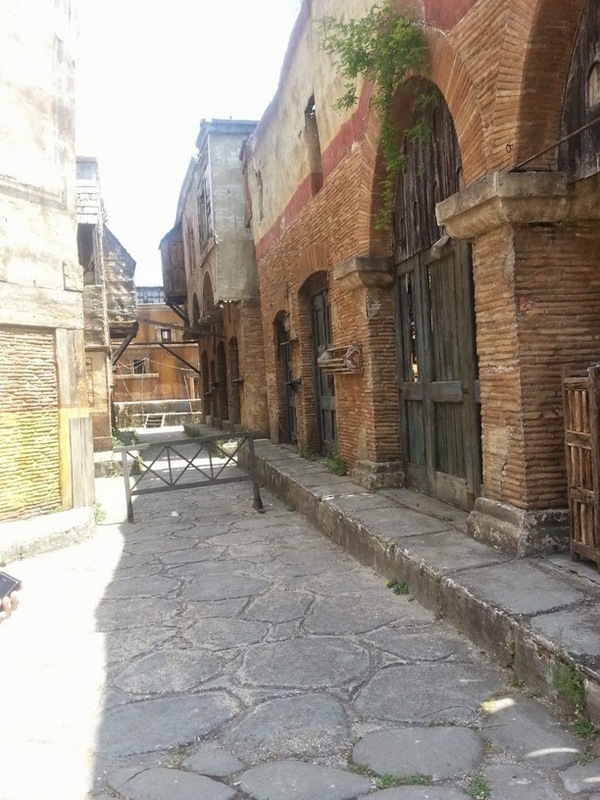 That's all for this week, but just before I go, here are a couple of photos I took at Cinecitta of the Rome set. Great television series ... if you haven't seen it, and you love ancient history, don't mind blood, rude words and scenes with lots of naughty bits, you'll enjoy it! This is one of the 'backstreets' of Rome on the set. Most of these were just facades but they were so life-like it was hard to believe they weren't the real thing. 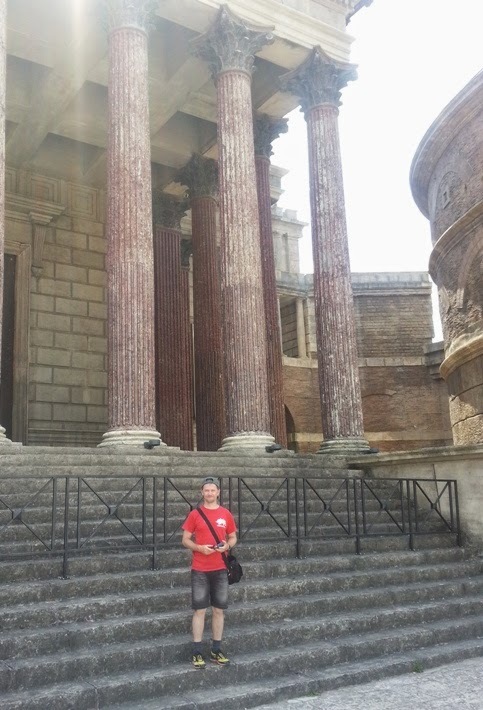 This is Stuart on the steps of one of the 'temples'.